Cecilia Albertini is a filmmaker originally from Milan, Italy, who has written and directed award-winning short films, and whose work has been broadcast on KCET, The Wrap and Indiewire.com. Her last short film, LABOR (2018) , was an official selection in over 20 festivals around the world, including the LA Shorts Film Festival, the Urban World Film Festival and the Rome Film Festival. It won Best Film at the Afrodite Shorts Film Festival in Rome, as well as Best Director at the Moscow Shorts Film Festival in Russia. Her documentary FRANCIS FORD COPPOLA'S LIVE CINEMA (2018) was nominated for the Heritage award by the American Society of Cinematographers and will be presented at the Riviera Film Festival in 2019. Her film ALLEGRA'S BODY SHOP (2018) was awarded Best Comedy at the Austin Comedy Short Film Festival in 2018. 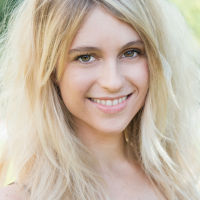 Cecilia holds an MFA in Film Directing from UCLA and a BA in Film Studies from Columbia University.